The lovely people at Forest and Shore kindly asked me if I would like to try some of their Hallelujah Hair Oil last week. (They must have looked at my hair and thought she needs some of what we've got). I'm quite picky with what I put on my hair, but after reading a little about the product and ingredients (I liked that it was 100% natural and organic, I loved the pretty packaging too) I said yes, so they popped a bottle in the post for me. When the box arrived, I was really impressed with the size of the bottle, as I was expecting something much smaller. The oil retails at £14 for 100ml, or £10 for a 50ml (plus delivery) which is pretty good value, considering that a little goes a long way with these types of products. Being a bit of a design nerd, I instantly fell in love with the packaging. The minimal frosted glass bottle, sits inside the prettiest botanical illustrated, pastel box. So if you're into displaying and arranging your beauty products in the bathroom for the world to see, then having a lovely little package like this, is all the more appealing. I've dyed my hair since the age of 18, and as I've always had long hair, I've tried to look after it's condition by regularly getting a trim, and using more high end salon recommended products, as I've always found these to be better for my hair, than those you can pick up from a supermarket. 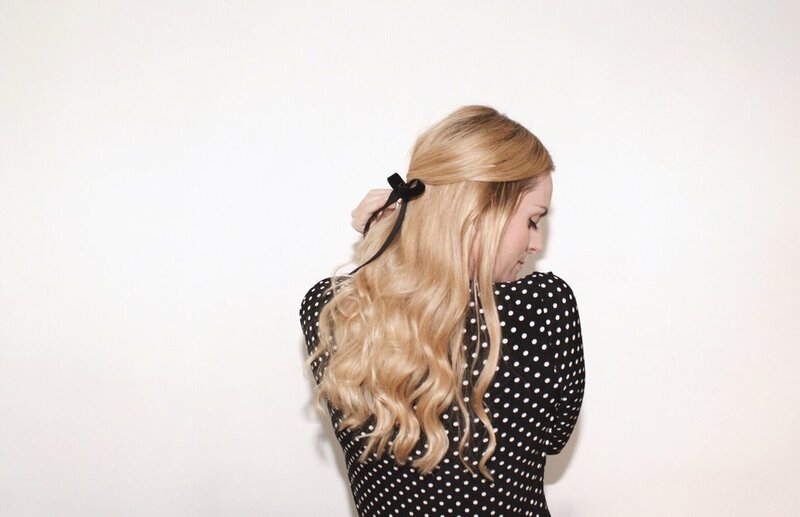 A lot of other beauty products you can seem to find good cheaper alternatives for, but I've always splurged a bit more on stuff for my hair, as I've always felt spending a bit more on better products was worth the investment. Saying that, as I hit the over 3o mark, I'd noticed my hair had become a little thinner in places (probably a combination of stress, dye and the sun) so I'd looked into treatments and shampoos, more geared up towards helping this. Scalp and hair oils, and the importance of giving your head a bit of a massage every week, was one of the things that I kept reading about, and people kept telling me about. It helps stimulate the hair follicle so I was eager to find a good product, something with natural ingredients, and give this a try for a few months. What's in the Hallelujah Hair Oil? 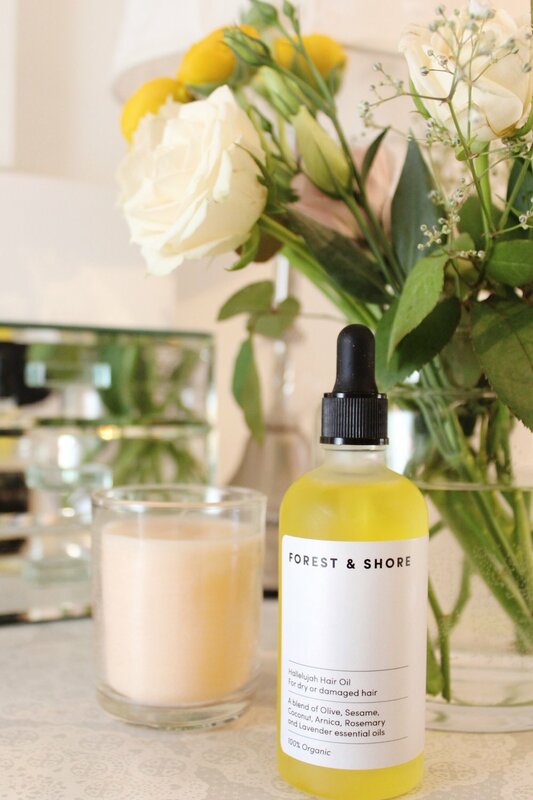 The Forest & Shore Hallelujah Hair Oil is 100% organic and has a blend of essential oils. This includes Rosemary & lavender (said to encourage healthy hair growth and strengthen hair), Coconut (the fatty acids in coconut are meant to nourish the scalp), as well as lemon, giving the hair oil a fresh citrusy scent. The formula is supposed to hydrate damaged hair, locking in proteins and which essentially encourages hair growth. There's two ways that you can use the oil, either as a post hair wash treatment ( a bit like how you would use Moroccan oil, you apply to the mid/ends of your hair and brush through, then dry) or as a intensive treatment (for scalp massage, leave on overnight, then wash). I like anything that is multi use, as it means we have to buy less and products that double up are great for taking on your travels too. (With this one, I'd probably dispense some into a smaller bottle, as wouldn't want to smash that lovely bottle in a flight bag!). With any products, it's definitely worth trying them out for at least a couple of months, to notice any benefits or changes, and I have to admit I'm always a bit sceptical with anything that has made up science-y words in them (you know, the ones that you can tell have been made up by an advertising agency) and again, as I've got older, I've got more and more into natural ingredients. The benefits that foods can have on our health and well being, and I've tried to cut back on the amount of beauty products I buy. So far, with the Hallelujah Hair Oil, I've been really impressed with how it's not only helped the ends of my hair feel less dry, but my scalp has been so much better, from regularly using the oil as a massage oil for my scalp. I also get really dry patches on my head at times, and since using this method, i've found that they've improved heaps and my scalp, in general feels much healthier. (Sorry if the scalp talk is a bit weird, but thought it was good to talk about these things!) :) You only need a little though, just put the 2-3 pipettes recommended, otherwise your hair might end up a bit too oily. I can't say I've noticed any drastic changes to my hair growing just yet, (I will keep you posted!) but the condition of my hair and scalp has definitely improved since using the oil, and I've only been using it for a few weeks so far. I'd definitely say it's worth the £10 and if you do try it out too, I'd love to know how you get on!